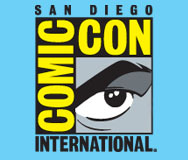 We are attending Comic-Con for the first time. It begins at the Kansas City airport, when I hear two people talking about the X-Files Reunion, and whether they can get tickets. Gillian Anderson, David Duchovny, and others will be on a panel honoring the 20th anniversary of the show’s debut. On the plane itself, nearly everyone is headed to Comic-Con. There are people wearing t-shirts with conspicuous logos (such as Batman), tell-tale reading material, conversations about Comic-Con. There are people with a “nerdy” look and people without, and many variations within and in between those categories. 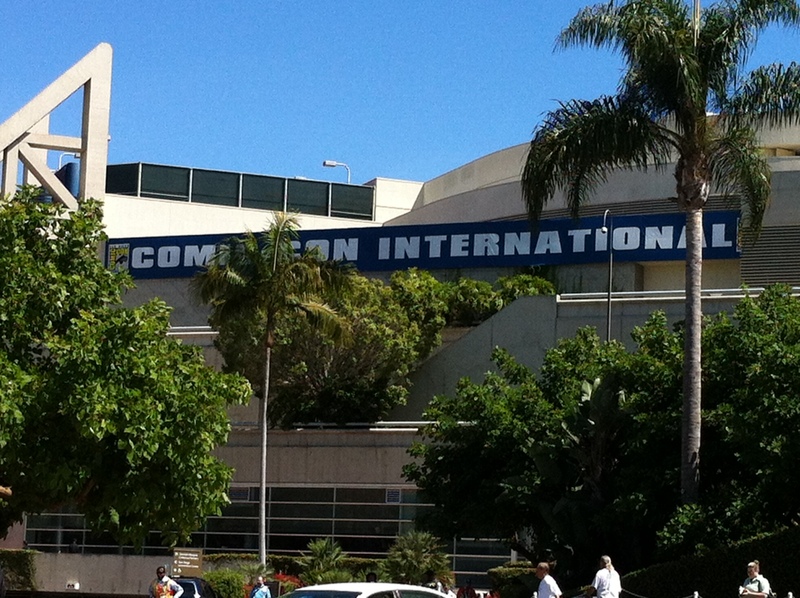 I am not wearing a t-shirt with a logo on it, but the woman checking us in at the hotel, asks, “Comic-Con?” Perhaps the conspicuous absence of a tan gives us away. After a short walk, we approach the convention center, and the crowds soon become as thick as any in Manhattan (New York, not Kansas) at midday. A few people are in costume. There’s a Spider-Man, and one of the crew of the original U.S.S. Enterprise (Star Trek). But most are in shorts and t-shirt (as I am) or jeans and t-shirt or in a dress. This, I think, is because my being an Eisner Award nominee places us in the “Professionals” category of registration. I expect to see more costumed attendees tomorrow. There are crowds of people already — even though the programming proper begins tomorrow. But it’s very well-organized. Stand in line, and there many volunteers making sure that your bar-code email matches your ID, and there lots of staff printing out the badges, directing you where to go. It moves quickly and efficiently. We were going to attend “Warner Bros. Television Preview Night,” but Karin’s tired. And, to tell the truth, I’m a bit tired myself … and I had some work to do. (Sent back edits on a book review, continued revising a fellowship proposal that I didn’t finish on the plane,….) I’m sure that some people reading this are thinking: What? You skipped free previews?! 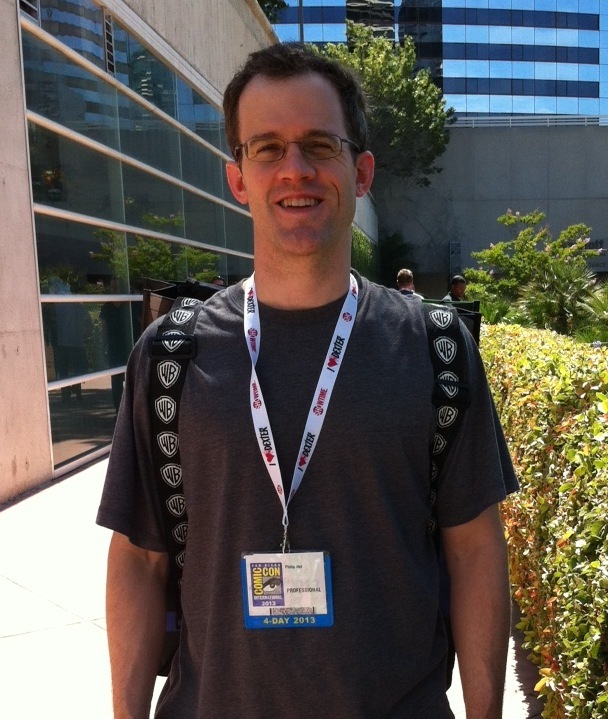 But, to be honest, I’m as interested in the phenomenon of Comic-Con as I am in individual panels. And, tomorrow after breakfast with Mr. Charles Hatfield and a morning signing at the Fantagraphics table, I am going to those panels. So… best to rest up for the big day. P.S. 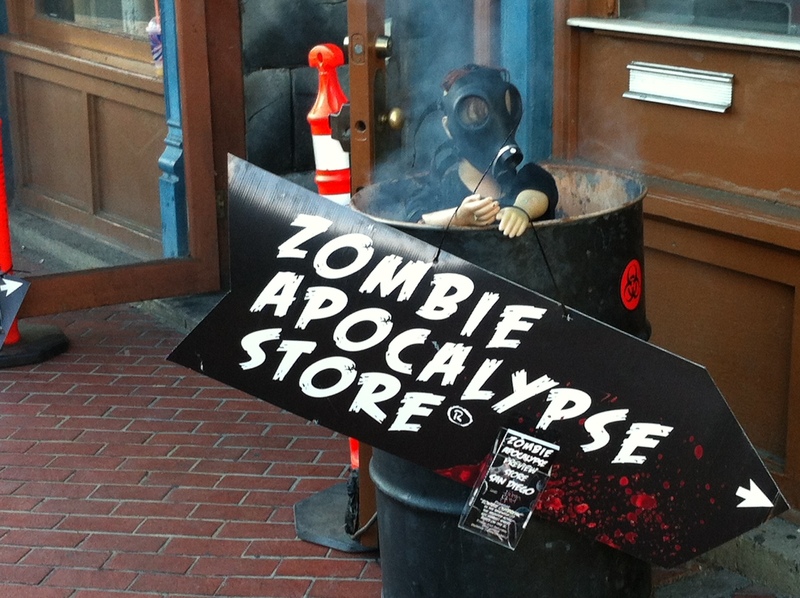 Appropriately, the Zombie Apocalypse Store is adjacent to a Hooters. No, I’m not kidding. If I were a better photographer, I’d have snapped a shot of the two establishments side by side. 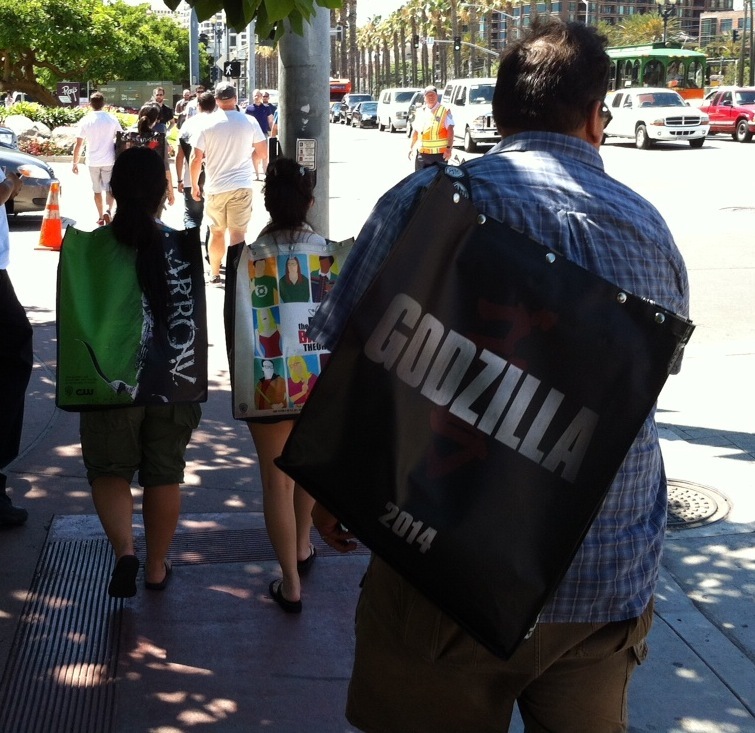 This is not part of Comic-Con (as far as I know). It just happened to be on the walk back from dinner.